In the latest edition of Things-We-Loved-Back-Home-But-Are-Missing-Majorly-Here-In-Barcelona, we turn today to some of the best noodles on earth. I’m not sure why, but there are currently only a handful of Thai restaurants in all of Barcelona — none of which are anywhere near our place, and none of which come super-highly rated by our local friends. Which has been a bit of a bummer, especially for a girl (hi!) who used to have a total Thai takeout obsession back home. I miss my weekly Curry Monday, Pad Thai Tuesday, and Fried Rice Wednesday specials! That said, after a year of lamenting our Thai takeout situation here, I finally decided to cut the complaining and just teach myself how to cook some of our faves en casa. I wasn’t interested in those close-but-not-quite kind of copycat recipes, that so often happen with takeout classics. I wanted recipes that tasted like the real deal. Turns out, it’s surprisingly do-able! My first triumph of the year was nailing our favorite Everyday Thai Curry recipe, aptly named because Barclay and I are obsessed and cook it all the time. My second was a new Thai fried rice recipe, which will be hitting the blog sometime soon. But perhaps best of all, I think I’ve now finally perfected a homemade Pad Thai recipe that legit tastes like the restaurant version. Or arguably, even better. This recipe is full of fresh and tangy flavors, it’s lightly sweetened with brown sugar (vs. the heaps of sugar that many American restaurants add nowadays), it can be made as pleasantly-mild or as knock-your-socks-off-spicy as you prefer, and it is ridiculously good. Just as any Pad Thai should be. I will note that there is one special ingredient that I’m going to strongly recommend you add to your grocery (or Amazon) list to make this dish happen. But otherwise, the ingredients here are all pretty standard stir-fry fare. And of course, when made at home, you have the flexibility to customize your Pad Thai recipe with whatever kinds of proteins, veggies, noodles and hot peppers that you prefer. So if any of you also happen to live in a place where really good Pad Thai is hard to come by — or hey, if it’s one of your faves and you’re ready to finally learn how to make it from scratch too — grab a bag of noodles and let’s make a batch together! 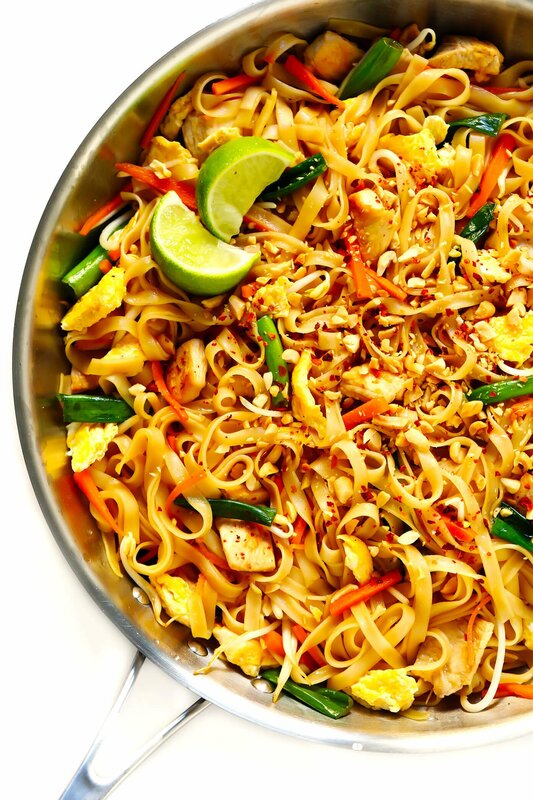 So exactly what is Pad Thai? In case you’re new to this one, I think it’s safe to say that it is probably the most famous Thai noodle dish. It’s made with rice noodles, some type of protein (chicken, shrimp, beef, pork, tofu, etc. ), a few light veggies and eggs. Then everything is tossed together in a yummy Pad Thai sauce, made with an irresistible blend of sweet, savory, tangy and spicy (if you’d like) fresh ingredients. And finally, sprinkled with the juice of a fresh lime and lots and lots of crushed peanuts. To be sure, authentic street food versions in Thailand can vary significantly from the Thai restaurant versions served around the world. But the version below is one that will hopefully taste familiar, and made with ingredients that you can easily source at your usual grocery store. Pad Thai Sauce: See below. 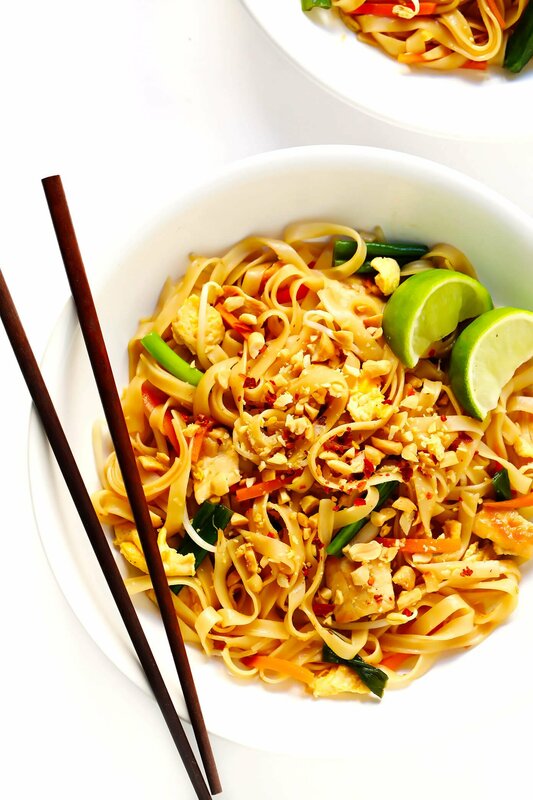 Pad Thai Noodles: Thin rice noodles are typically used, but any width will work. Oil: Any kind of mild oil that you like will work — olive oil, avocado oil, peanut oil, coconut oil, etc. Protein: You guys voted by a landslide for a Chicken Pad Thai recipe on Instagram, so that’s what I have photographed and written out below. But I have also included instructions for how to make Pad Thai with shrimp, pork or beef. 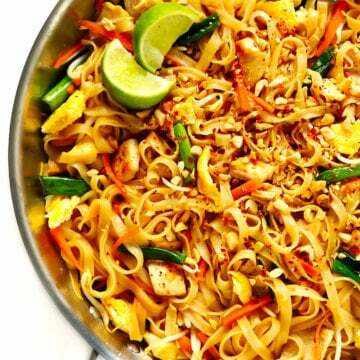 Or a meatless Pad Thai (with or without crispy tofu). Veggies: I went classic and included used fresh bean sprouts and shredded carrots in this recipe. But feel free to add in any other stir-fry veggies that you love. Green onions: Actually, garlic chives are the authentic ingredient to use here. But since they can be hard to find, I have written this recipe using green onions. Eggs: Which we will whisk, scramble and add to the stir fry. Toppings: I highly recommend topping your noodles with lots and lots of chopped peanuts. And of course, a fresh lime wedge. Plus some extra crushed red chili flakes if you would like some extra heat. Tamarind Concentrate: Which is — ta da! — the secret ingredient I highly recommend getting your hands on. 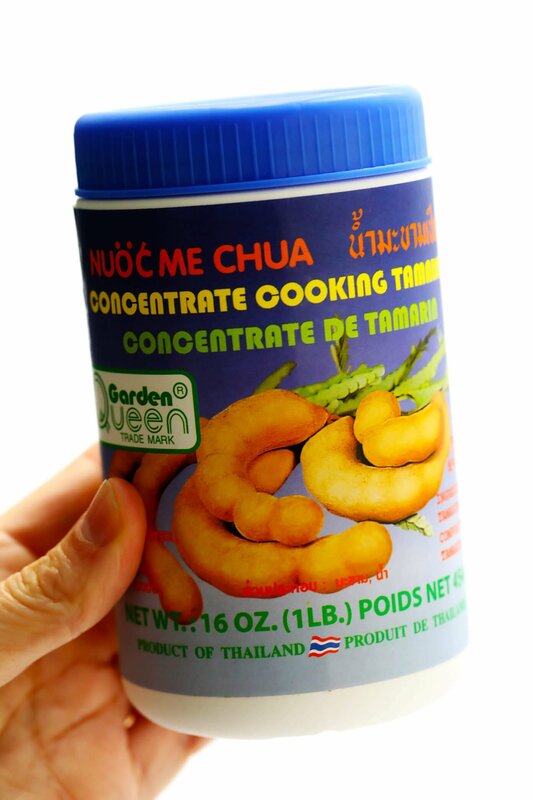 Tamarind concentrate is one of the starring ingredients in authentic Pad Thai. It has a sweet and tangy flavor, and in my opinion, totally makes this dish! When shopping, be sure to look for tamarind concentrate (not paste) that is made with 100% tamarind and no added sugars or corn syrup. You can find it at Asian groceries, or I just buy mine on Amazon. I should note, though, that many American Thai restaurants have switched to using ketchup instead of tamarind concentrate, which yields a much more sweet and red-ish Pad Thai. So if you can’t track down tamarind concentrate, you can try subbing in 3 tablespoons of ketchup and 1 tablespoon of lime juice instead of the tamarind concentrate. Brown sugar: Actually, palm sugar is traditionally used in Pad Thai sauce. But if you don’t have that in your pantry (like me), regular brown sugar will work just as well. Fish sauce: One of my favorite pantry ingredients! It’s going to smell a bit funky as you’re whisking up the sauce. But trust me — fish sauce is a critical ingredient in making these noodles taste like the Pad Thai we all know and love. That said, not all fish sauces are created equal. I’m a big fan of Red Boat and Three Crabs fish sauce brands, both of which are a bit more expensive but have a richer flavor and don’t smell quite as “fishy.” But really, any kind of fish sauce you can find will work. Soy sauce: I prefer low-sodium. Lime juice: Freshly-squeezed, of course. Crushed red pepper flakes: Or you can use sriracha or garlic chili sauce, or whatever your preferred hot sauce may be. To make the Pad Thai sauce recipe, simply whisk all of these ingredients together until combined. Or do what I do, and just combine them in a mason jar and shake-shake-shake until combined. Heads up — once you begin cooking the actual stir-fry (step 3 and on), this recipe actually goes really fast. So I highly recommend prepping all of your protein, veggies, eggs, sauce and toppings ahead of time so that you don’t get held up partway through. Cook the noodles. Meanwhile, cook your noodles al dente according to package instructions. Then drain, rinse with cold water, and toss with oil to prevent them from sticking. Cook the chicken. Sauté the chicken on high heat until it’s cooked through. Cook the veggies. Sauté the bean sprouts, carrots, and garlic briefly. Cook the eggs. Push the veggies to one side of the pan, and add the eggs on the other side. Then scramble the eggs, stirring occasionally. Serve. Dish it up while it’s nice and hot, sprinkled with lots and lots of crushed peanuts, extra crushed red pepper flakes (if desired) and a good squeeze of fresh lime juice. Use a different protein: I have included directions in the recipe below for how to make beef, pork or shrimp Pad Thai. 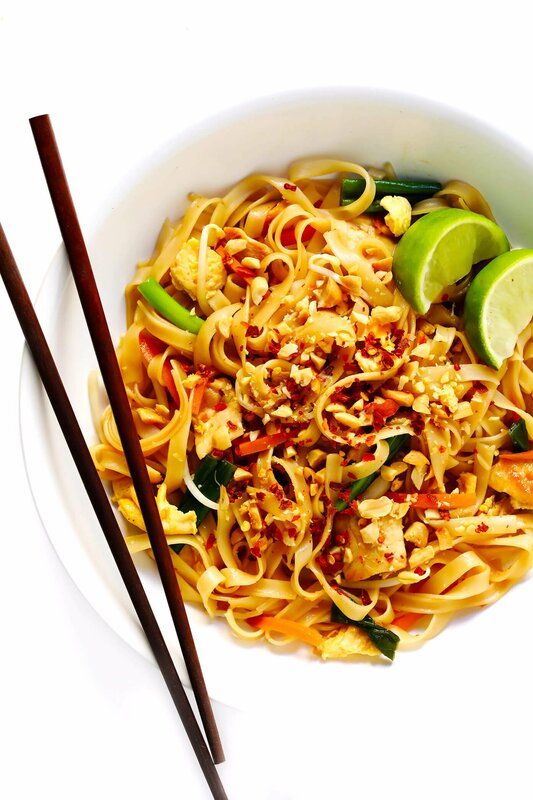 Also, how to make meatless Pad Thai with or without tofu. Use zoodles: To add even more veggies to this dish, feel free to substitute zucchini noodles for 50% (or 100%) of the rice noodles. Make it more peanut-y: If you love a good peanut sauce, feel free to stir 1-2 tablespoons of natural peanut butter into the sauce as well. Make it spicier/milder: Just use more/less of the crushed red pepper flakes, or skip them entirely. Make it sweeter: If the sauce isn’t as sweet as you would like, stir 1-2 additional tablespoons of brown sugar. 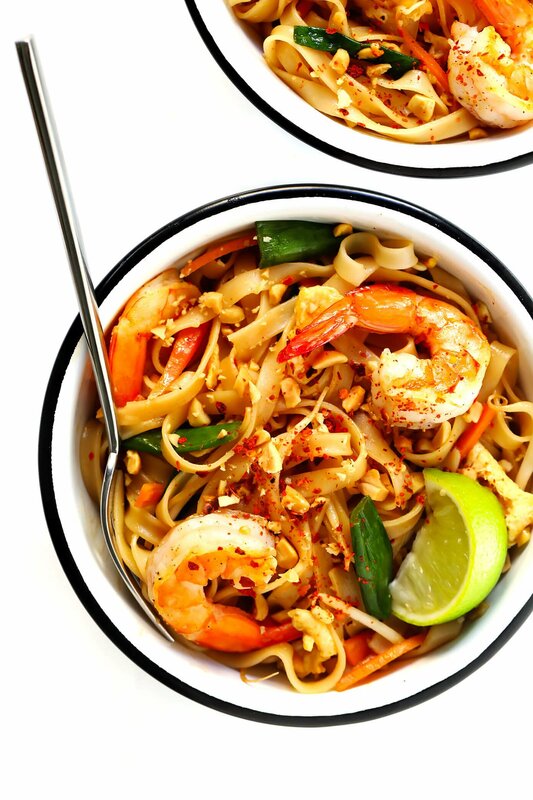 This easy Pad Thai recipe tastes just as good (or better!) as anything I’ve had in a restaurant. Plus it’s easy to make and customize with whatever ingredients and spice level you love! Chicken, steak, pork, shrimp, tofu and veggie-only options included below. Make the sauce. Whisk all ingredients together in a medium bowl (or shake together in a mason jar) until completely combined. Set aside. Cook the noodles. Meanwhile, cook your noodles al dente according to package instructions. Drain the noodles in a strainer, then rinse with cold water briefly to halt their cooking. Toss with one tablespoon oil briefly, to prevent the noodles from sticking. Cook the chicken (or see other options below*). Heat one tablespoon oil in a large sauté pan or wok over high heat. Add the chicken and sauté for 3-5 minutes, tossing occasionally, until the chicken is lightly golden on the edges and cooked through. Use a slotted spoon to transfer the chicken to a clean plate. Cook the veggies. Add the remaining one tablespoon oil to the sauté pan, along with the bean sprouts, carrots, and garlic. Sauté for 2 minutes, stirring occasionally. Cook the eggs. Push the veggies to one side of the pan, and add the eggs on the other side. Cook the eggs until scrambled, stirring often. Put it all together. Then add everything back in — the cooked noodles, chicken, sauce and green onions. Give the mixture a good toss until everything is evenly coated in the sauce. Remove pan from the heat. Serve. Then serve the Pad Thai while it’s nice and hot, sprinkled with lots of crushed peanuts, extra crushed red pepper flakes (if desired) and a good squeeze of fresh lime juice. SHRIMP PAD THAI: Season 1 pound of large shrimp (peeled and de-veined) with salt and pepper. Sauté in 1 tablespoon oil over high heat until the shrimp are bright pink and cooked through, stirring occasionally, about 1-2 minutes. Transfer to a clean plate and set aside. BEEF PAD THAI: Thinly slice 1 pound of lean steak (against the grain), then cut into bite-sized pieces. Season with salt and pepper. Sauté in 1 tablespoon oil over heat until the steak is browned on all sides, stirring occasionally, about 3-4 minutes. Transfer to a clean plate and set aside. PORK PAD THAI: Thinly slice 1 pound of lean boneless pork chops, then cut into bite-sized pieces. Season with salt and pepper. Sauté in 1 tablespoon oil over heat until the pork is browned on all sides, stirring occasionally, about 3-4 minutes. Transfer to a clean plate and set aside. 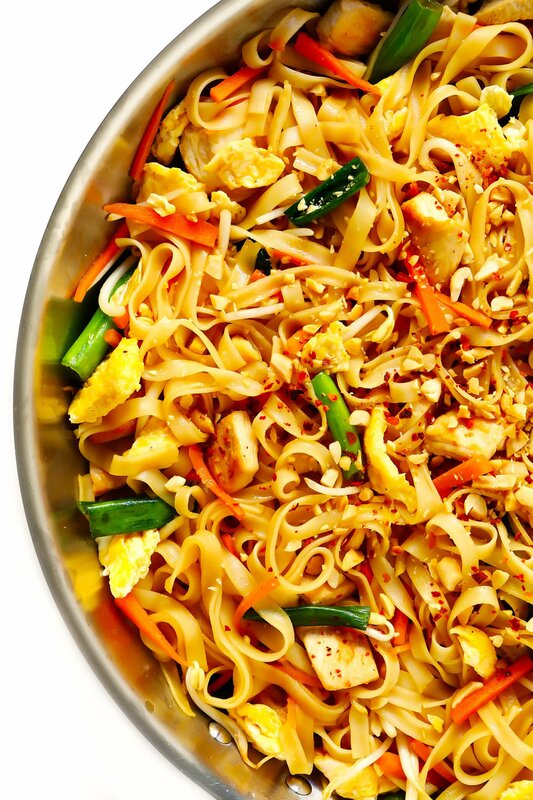 TOFU PAD THAI: Slice 1 (14-ounce) block of extra-firm tofu into 1/4-inch slices. Sandwich the slices between paper towels, press and drain for 30 minutes. Cut the tofu into bite-sized pieces. Season with salt and pepper. Cook the tofu in 1 tablespoon oil in a non-stick pan in a single layer for 2 minutes, undisturbed. Then flip the tofu and cook on the second side for 1-2 minutes, until lightly browned. Transfer to a clean plate and set aside.